Salmonella enterica subsp. houtenae serovar 16:z4, z32:-- str. RKS3027 was isolated from a human in Illinois, USA. S. enterica subsp. houtenae is a facultative aerobic rod-shaped Gram-negative bacterium. Here we describe the features of this organism, together with the draft genome sequence and annotation. The 4,404,136 bp long genome (97 contigs) contains 4,335 protein-coding gene and 28 RNA genes. Salmonella is an important genus of human and animal pathogens , and more than 2,600 different serovars have been described. Currently, the genus Salmonella is divided into two species, S. enterica, and S. bongori . S. enterica comprises seven subspecies: I (also called subspecies enterica), II (also called subspecies salamae), IIIa (also called subspecies arizonae), IIIb (also called subspecies diarizonae), IV (also called subspecies houtenae), VI (also called subspecies indica), and VII . Most of Salmonella serovars belong to the S. enterica subspecies I and are responsible for disease in warm-blooded animals and humans . Other serovars were usually isolated from cold-blooded organisms and the environment, but could also cause human disease occasionally. In contrast with S. enterica subspecies I, very limited information is available regarding pathogenicity of the other subspecies. When infecting humans, these serovars usually cause an intestinal infection (e.g., diarrhea), but previous reports in the literature  have shown that the serovars of Salmonella subspecies II–IV are capable of causing serious infections, including septicemia and abscesses. There has been an increase in case reports on extraintestinal infections caused by these subspecies . S. enterica subsp. houtenae serovar 16:z4,z32:-- str. 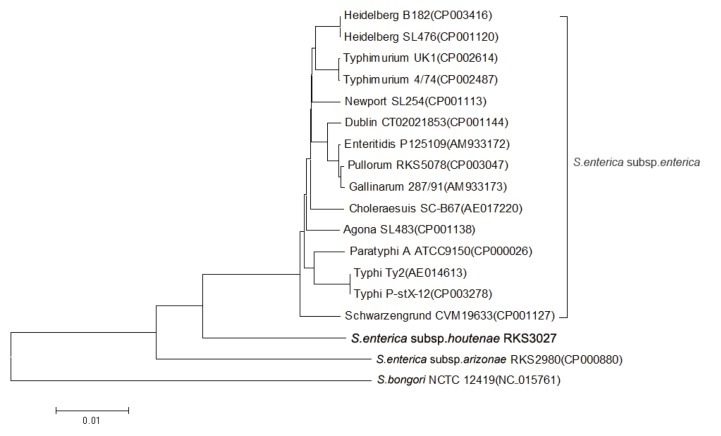 RKS3027 is a human isolate. This strain is of interest because of its pathogenicity as well as its divergent phylogenetic position among S. enterica. The Salmonella genus belongs to the bacterial family Enterobacteriaceae . The bacteria are rod shaped, Gram-negative, with diameter of 0.7 to 1.5 µm and length of 2 to 5 µm (Table 1). They are facultative anaerobes, non-spore-forming, flagellated, and motile. They grow within the optimal temperature range 35 °C - 37 °C and within an optimal pH range of 7.2-7.6. S. enterica subsp. houtenae is salicin-positive and able to grow in KCB medium, two distinguishing characteristics when compared with S. enterica subsp. enterica. The strain is deposited in the Salmonella Genetic Stock Centre (SGSC), University of Calgary, Canada as S. enterica subsp. houtenae RKS3027 (= SGSC 3086). Jiang LW, Lin KL, Lu CL. 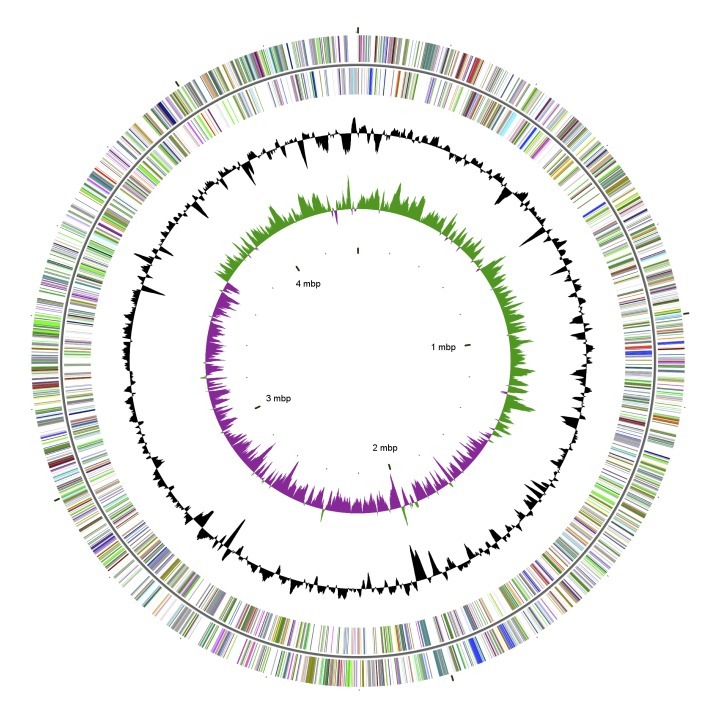 OGtree: a tool for creating genome trees of prokaryotes based on overlapping genes. Nucleic Acids Res 2008;36(Web Server issue):W475-80. Ewing WH. Edwards and Ewing’s identification of Enterobacteriaceae 4th ed. Burgess Publishing Co., New York, NY. 1986. Le Minor L, Rohde R. Genus IV. Salmonella Lignieres 1900, 389. In: Buchanan RE, Gibbons NE (eds), Bergey's Manual of Determinative Bacteriology, Eighth Edition, The Williams and Wilkins Co., Baltimore, 1974, p. 298-318.